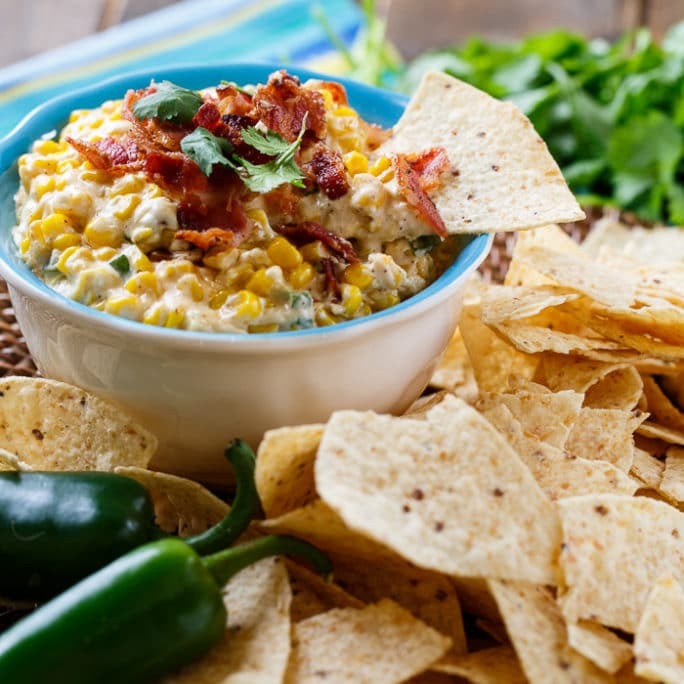 Crock Pot Spinach Artichoke Dip is an easy, hands-off party appetizer that tastes great served with homemade pita chips, Frito corn chips, tortilla chips, crackers, or even veggie sticks. 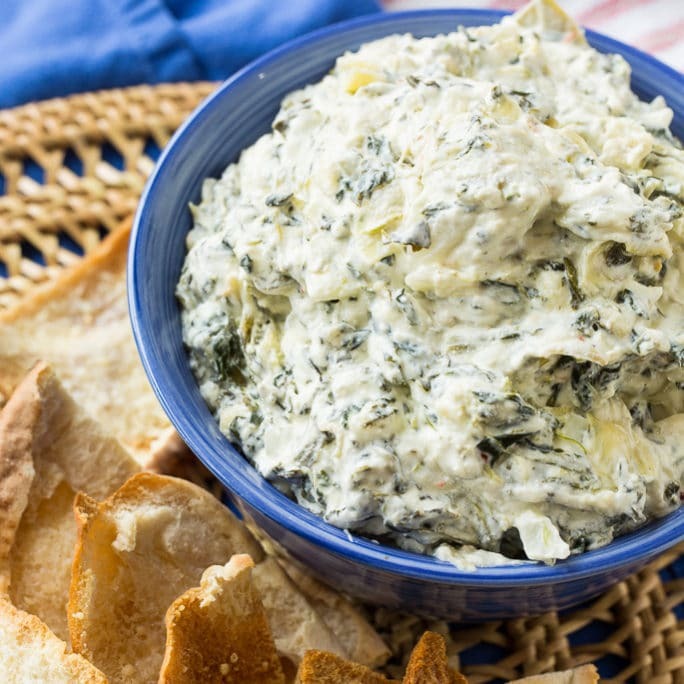 Spinach Artichoke Dip is such a classic party dip that never gets old. The spinach-artichoke combo is a real winner flavor wise. The bonus of cooking it in a crock pot is it’s ready when you’re ready for it and if you want to keep it warm the whole time you serve it, just leave it in the crock pot. 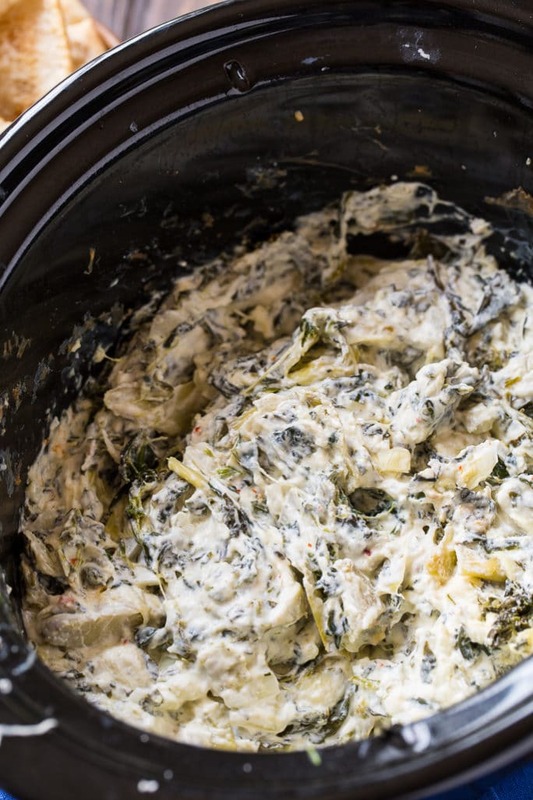 Making Spinach Artichoke Dip in the slow cooker is virtually hassle free. Just combine all ingredients in the slow cooker, give it a stir and look on LOW until everything is warm and melted and the flavors really blend. It’s fantastically ooey, gooey, and delicious with a blend of cream cheese, sour cream, mayonnaise, mozzarella cheese, and Parmesan cheese plus some garlic powder and red pepper flakes to add some flavor. Crock Pot Spinach Artichoke Dip is so creamy and rich and making it in the crock pot is totally hassle free. Serve with pita chips for an easy appetizer. Spray a 3 to 4-quart crock pot with cooking spray. Ad all ingredients to crock pot, stirring to combine. Cook on LOW for 2 hours stirring about halfway through. Also try these other creamy dips made in a crock pot. This entry was posted in Appetizers, Slow Cooker and tagged artichoke, dip, spinach. Bookmark the permalink. I omit the onion and just used onion powder around 3/4 of a teaspoon and it’s great. I loved Chili’s spinach artichoke dip when they had it and this is very close to the taste of theirs. Love it! Has anyone tried adding real bacon bits? I made this for my family. I left out the artichoke hearts because we don’t like them. It was the best spinach dip I’ve ever had! Everybody loved it and wanted the recipe. I’ll definitely make this again. Pita chips are delicious with it! can you make this ahead of time without cooking it and then put in the frig overnight then cook the next day?? can you make this the night before and just put it in the refrigerator and cook the next day?? What kind of mayonnaise is everyone using? This dip is delicious! It’s my new favorite. Very creamy. Way better then anything you would get as an appetizer at a restaurant. Can you omit the spinach?? Since spinach is one of the main ingredients, I feel like you would need to add something in its place. Maybe try doubling the artichokes or using kale. Far too strong of onion taste for my liking. I’d nix the onion all together, but if you’re going to add it at least cook the onions down some so the onion taste doesn’t overtake the dish. Otherwise, creamy and gooey and the perfect texture. Would make again! I just got done cooking a double-batch of this for my Christmas Eve shindig tonight. To die for! Warm and gooey and cheesy… What more can you ask for? And the red pepper flakes give it a nice little kick at the end. I found it needed a bit more salt after tasting it initially, but that may be because I used half Greek yogurt-based cream cheese and half regular cream cheese. Either way, it’s REAL good. Highly recommend! Easy and delicious! How long did you cook the double batch? I’d like to make it for a Christmas party this year! can I use fresh spinach instead of frozen? Is this a freezable recipe??? You can, but the texture will suffer some. How many people will this recipe serve? I would say about 10. What is your choice of Chip with this? Pita? Tortilla? I have made this a few times & now people ask for it when I go to parties! This is such a crowd pleaser! So glad to hear that!! 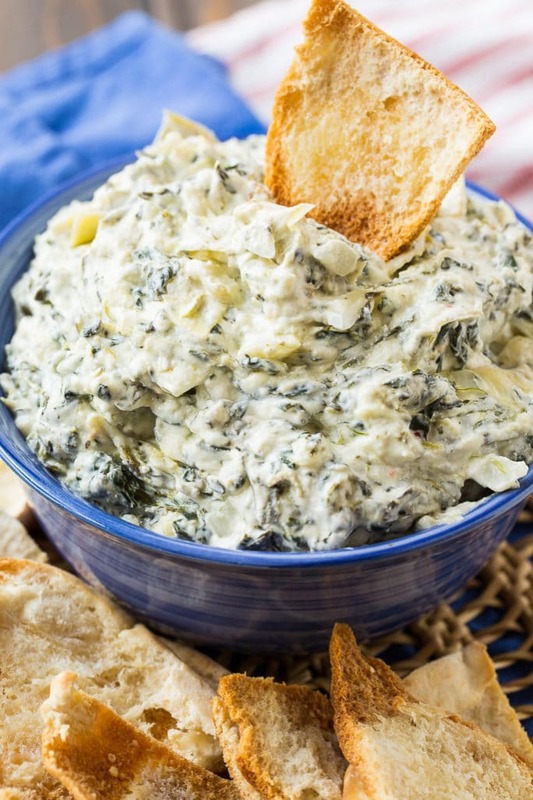 Mmm spinach artichoke dip is one of my favorites, and I can only imagine how delicious it must taste in the crock pot! Such a perfect party appetizer! I love spinach artichoke dip. This is a great recipe!